← Two things to celebrate! 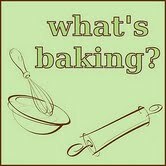 It took me about three seconds to decide what my contribution would be for this month’s What’s Baking challenge. Dani from Cloud 8 1/2 chose “A Family Favorite” as the theme, and I immediately knew I’d be making one of our family’s absolute best dishes. Although my Nana is Greek, she made amazing Italian food. I guess if you marry an Italian and live in his country for a while, you don’t have much of a choice but to perfect the cuisine. Most of her memorable meals are from her homeland, but this dish is one that shines through just about all of the others, and I often wonder if perhaps her mother-in-law showed her the ropes with it. The additions of hard boiled egg and salami may seem odd to some people…and for those people, I feel very sorry. Don’t judge. Just trust me. I try my best to give accurate measurements when making dishes like this – ones that I’ve been making for so long and never measured before. I do it now because I know it helps all of you. 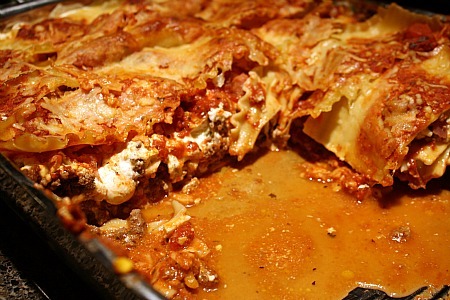 But, with lasagna, much of it really is approximate, or enough to fill or layer the pan that you’re working with. So, a lot of eyeballing may be necessary. Preheat oven to 350 degrees. In a bowl, combine ricotta with egg and a bit of salt and pepper. Set aside. Place all other items in separate bowls to prepare for layering. Cover the bottom of a 9×13 pan with some marinara. 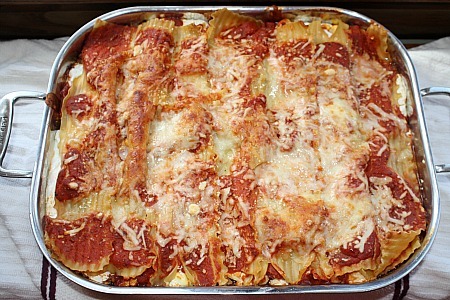 Add 8 lasagna sheets, layering them vertically (this is approximate – use enough to cover the bottom of your pan). Add beef on top of pasta, followed by spoonfuls of the ricotta mixture, followed by mozzarella, then egg and salami. Top all ingredients with sauce, then add another layer of pasta, and continue in the same order as above. Add sauce, then the top layer of pasta, followed by more sauce, a little mozzarella, and pecorino romano. Bake for about 35-40 minutes, or until lasagna is entirely heated through. Let rest for a few minutes before cutting. Linked to: What’s On Your Plate? This entry was posted in beef, eggs, family, freezer friendly, Italian, main dishes, make ahead, mozzarella, pasta, pork. Bookmark the permalink. This looks wonderful! What a good excuse to jot down the recipe for your daughter to have, too, as well as sharing it with the rest of us. You’re right, I’ve never heard of hard boiled eggs or salami in a lasagna, but if you’re saying it’s good, I’m believing you. Eggs are such a different ingredient for what I think of in lasagna – but why not? I will trust you on this, and try it! I love lasagna. It’s one of my favorites. I’m not sure about the hard boiled eggs but I know Frank will be excited if I tell him I’m putting salami in the pasta! 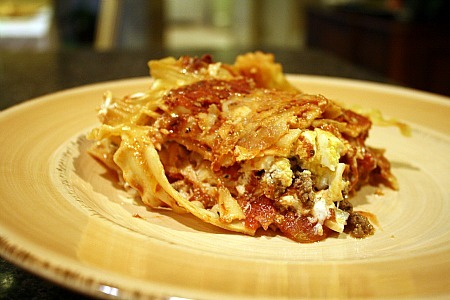 Lasagna is definitely my favorite family dish to make, too! It’s always so impressive and yet…so easy! Yum, that looks fantastic! If you have the chance, come by & link this & anything else you have up at Makin’ You Crave Monday over at MrsHappyHomemaker.com! Yum! Love lasagna and love that yours is connected to some great memories of Nana. My German grandmother also made a killer lasagna. Come on over and share on Hunk of Meat Monday. I add chopped german salami to all of my meat type sauces such as spaghetti, lasagna and stuffed shells. It’s amazing and was happy to see it also in this recipe… it MUST be great! Will have to try the eggs also! Adding lasagna with egg and salami already sounded like pizza to me. Although I thought “It’s a great idea!” because it’s not the conventional lasagna. I always have a thing for lasagna. I love the cheese, the sauce and the overall taste. Thanks for sharing this. I’ll definitely make this at home.